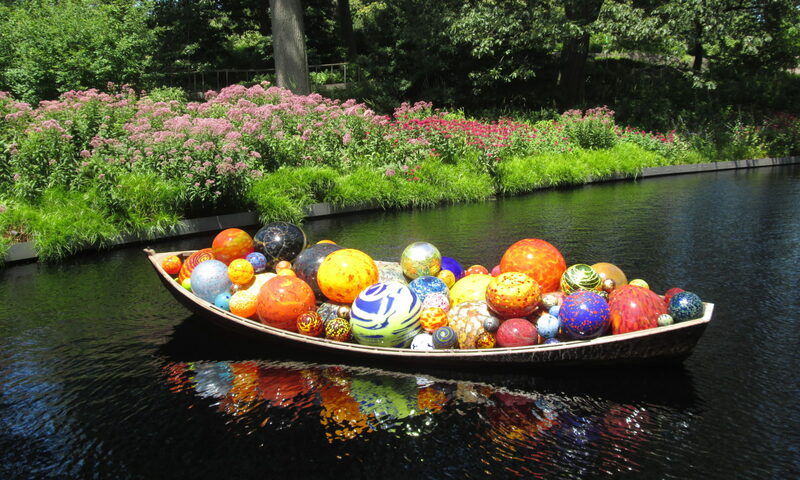 You’ve probably seen glass artist Dale Chihuly’s work before. 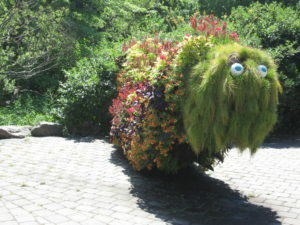 But it’s lovely to see it in the garden settings of the New York Botanical Garden, where it will be through October. For this exhibition, there are plenty of his older works, and a few made for this show. We went over to see it on a beautiful summer day. It was my first time at the NYBG as well, so I didn’t know what to expect. We spent four hours there, and still didn’t see all the gardens (though we saw all the Chihulys, I think). Starting from the entrance by the Conservatory gate, we went first to the library building to see what was inside. 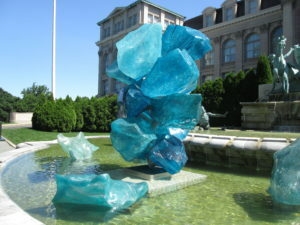 Outside at the fountain, there’s a Chihuly sculpture that’s actually not blown glass, but molded/layered plastic. It looked like giant ice cubes or icebergs. Inside you’ll find some stunning pieces of older works, and some videos. 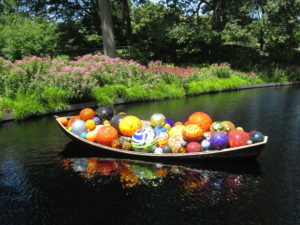 It’s worth a stop, even though it feels weird to go inside into a stuffy building when it’s nice outside, and most of the sculptures are in the conservatory. A few sculptural installations are spread out in the grassy areas. You’ll need to do some walking. The NYBG is huge, so even walking from the front gate to the conservatory took awhile. Given that it was our first time there, we walked around a lot before realizing we weren’t going to see it all. We then took the tram for part of the way (I was getting tired!). Here are some of the sculptures we saw. 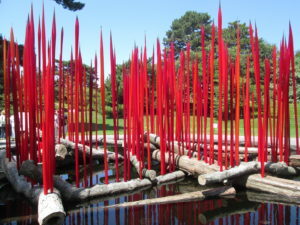 Interactive guide: get the app before you go or get on wifi there to access additional information about the Chihuly pieces. It also tells you the location of the closest sculptures, which is helpful when you’re wandering around the outdoor spaces. Film screenings: Inside the library auditorium, they run screenings of short films. It’s a great introduction to his work and shows you how the sculptures are blown and assembled. 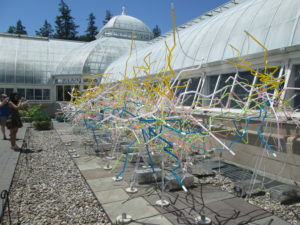 You’ll also see other exhibitions and the Seattle permanent site for his work, by the Space Needle. The films are short enough so kids won’t be bored, and you can come and go as you please. No extra cost for these. 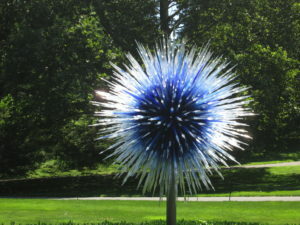 Chihuly at Night: Go at night, Thursdays through Saturdays, and you can see this sculpture (and others) lit up. This one is neon, though, and electrified. Reservations are required. It would make a great date night, as they offer cocktails, shopping and food. But they do have kids’ prices too! 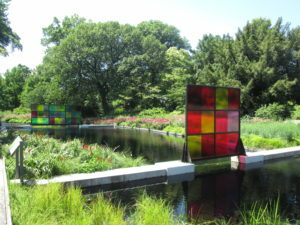 Look for the poetry: The results of the kids’ poetry contest is displayed through the NYBG. Stop and read the poems. Your kids might like to read what other kids wrote. There’s also a teacher’s guide and lesson plan you can read and bring with you (look under the poetry section for the links) to help talk about it with your kids. If you’re short on time or attention span, head there first. 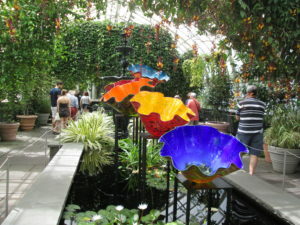 You do need a Chihuly ticket at the conservatory. The children’s garden is also large and worth a stop. You need a ticket admitting you to the children’s garden.